We just purchased a clean older RV and have discovered a leaking plastic toilet. The toilet leaks from the top back when the "flush pedal" is in operation. If the toilet's not flushing, there's no leak. Any suggestions? Joanne, the symptoms you’ve indicated point to a faulty vacuum breaker assembly in the upper reaches of the toilet. At the age of your motorhome, I’m guessing it is probably a Thetford Aqua Magic or an earlier version of that toilet. 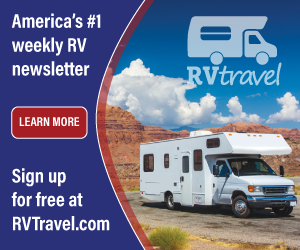 Repair parts are still readily available at any well-stocked RV parts store. 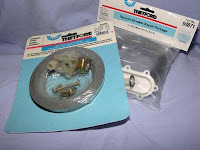 The toilet will have to be removed from the coach for the repair, but the actual parts replacement is relatively easy if you are handy with common hand tools. I would recommend replacing all the seals in the toilet also since you will have the toilet out of the RV during the repair anyway. Again, the seals and the vacuum breaker assembly are fairly easy to replace, albeit a little messy (I always wear latex surgical gloves when working on any waste system component). Each kit will come with definitive how-to instructions. After obtaining the correct parts, begin by turning off the water supply (water pump and city water) to the toilet and bleed the pressure by flushing the toilet one last time. Remove the water inlet line at the rear of the toilet; it’s usually best to plug or cap that line while the toilet is removed. The toilet is held to the floor flange by two closet bolts positioned at about 11 and 5 o’clock when facing the toilet as installed. To gain access to the front (5 o’clock) bolt, depress both foot pedals; you’ll be able to get an end wrench in there fairly easily, but a ratchet wrench actually works better if you have one. An off-set ratchet wrench works the best. The back bolt can be accessed by reaching behind the toilet or by removing a knockout plug located under the seat at about the 11 o’clock position. A socket extension and universal joint will most likely be needed if approached in this manner. Once you remove the two closet bolt nuts, simply lift the toilet up and over the bolts and take it outside. Place the toilet upside down on a workbench with the rear of the toilet facing out. You’ll now be able to see all the innards inside the toilet casing. Read and follow the replacement instructions as written for the vacuum breaker and the seals. Reinstall the toilet in the coach by reversing the above steps. Connect the water line, apply water pressure and check for leaks. Not a pleasant task for sure, but one easily accomplished by the handy do-it-yourselfer.